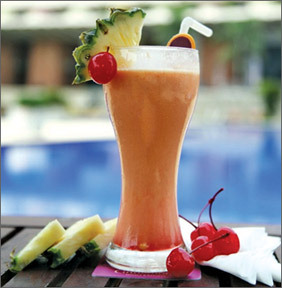 Cinnamon Lakeside Colombo introduces a range of beverages designed to revitalize and revive this sweltering March month. The hotel offers guests and diners a relaxing ambience although it is located in the heart of a bustling city. CLC adds a new zing to its beverage menu with a classic twist of frozen fruit and a traditional daiquiri to give you the ‘Frozen Fruit Daiquiri’ at The Lounge this March. 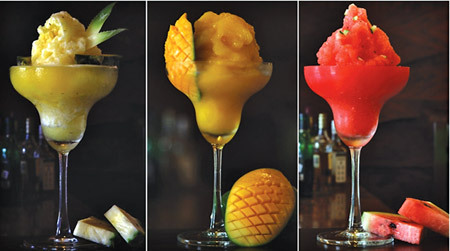 The Frozen Fruit Daiquiris are prepared with a variety of fruit including strawberry, mango and pineapple puréed with a dash of some bartender’s classics, sugar syrup and pulverized ice, providing the required sweetness sourness and texture perfect for a warm day. Originating in Latin America in the 1900’s, the ingredients of the traditional daiquiri include lime, sweeteners and other popular spirits. However the award winning bartenders at CLC let their creative spirits fly with this new range of exotic frozen fruity concoctions. Beat the heat with an exotic cocktail at the CLC poolside and try out the latest addition to the intriguing poolside cocktails, the Pink Colada. Guests can also explore the taste of the tropics with a range of other cocktails, mocktails and scrumptious snacks. The trendiest bar in town, 7 Degrees North at Cinnamon Lakeside Colombo serves up a selection of Fruity Mexican Frappés, the perfect sundowner for a warm day. The blend of fruity flavours with a dash of lime, pulverized ice and other bartender specials make these beverages a refreshing and easy way to fit in fruit any day of the week. One could also taste the Mojito, Sangria, Long Island and Bull Frog infused with the bar’s own twists to suit your every mood. The range of cocktails at the bar also includes the hotel’s signature beverage, the ‘7 Degrees’ cocktail. If not, one can sip on at the deck, you could choose from the mocktail range which includes the ever popular Virgin Mojito, Muscle Hunk and Red Island.